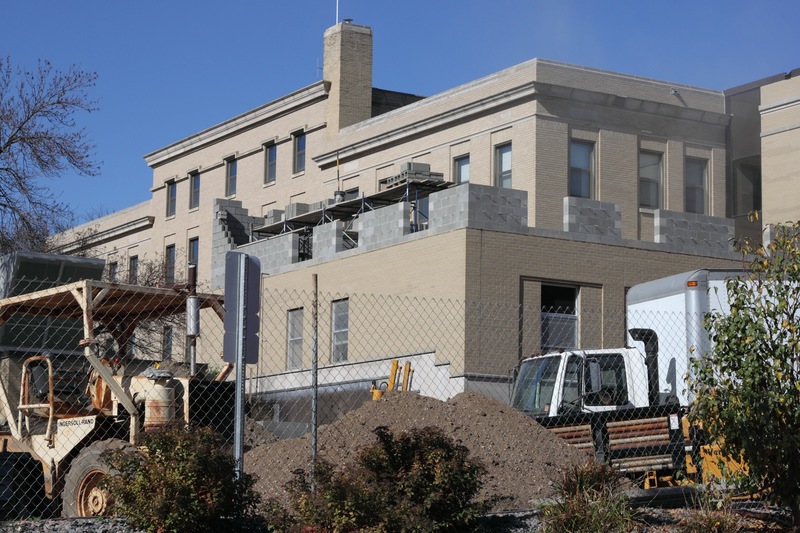 Our stately Pope County Courthouse was built in 1929 replacing an earlier 1879 brick structure on Courthouse Square – a full city block donated by Kirk J. Kinney. Kinney, together with Alfred Lathrop, laid out the village of Glenwood in 1866. The 1930 dedication of the Courthouse was a three day event of parades and historical pageants. The Courthouse was placed on the National Register of Historic Places in 1982. 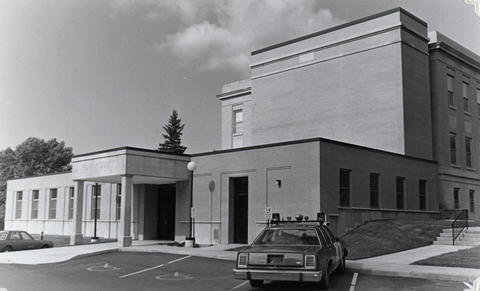 A new law enforcement wing was added in 1983 and expanded in 2010/2011 and the front entrance was restored in 2012. Classicism, the building features three bays on the center section divided by pairs of engaged pilasters, a dentillated cornice with a wide frieze carrying the legend “Built to Perpetuate Civic Order and Justice”, and a decorative architrave surmounted by a name and date panel at the central a entrance. Stone is also utilized as the water table and wall material for the ground floor of the building. Fenestration is symmetrical, with second and third story windows of the side sections linked vertically by placement in recessed panels. Decorative metal work includes grilles on the panels and transom of the main entrance,” and circular light standards flanking the entrance. Interior surfaces utilize Vermont marble, terrazzo, sculptured plasterwork, and specially designed metal stair rails. Both the interior and the exterior have retained a high degree of integrity. – National Register application. 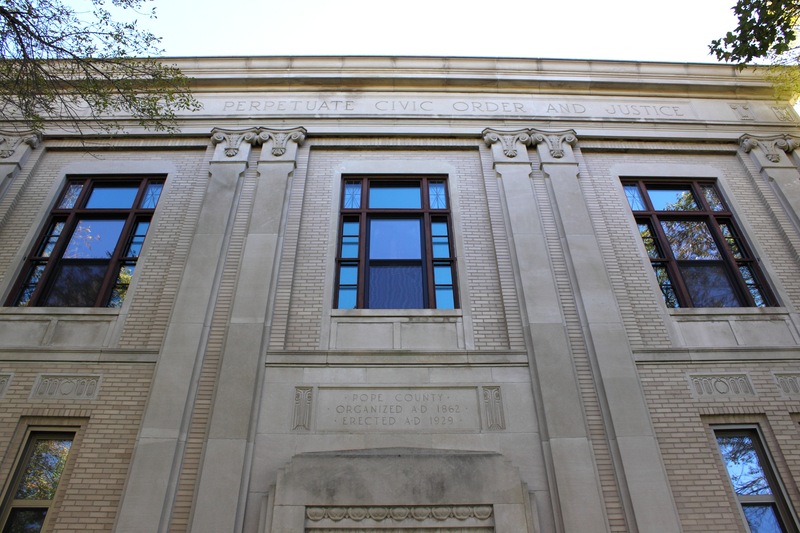 Click here for information on Pope County’s earlier courthouses. 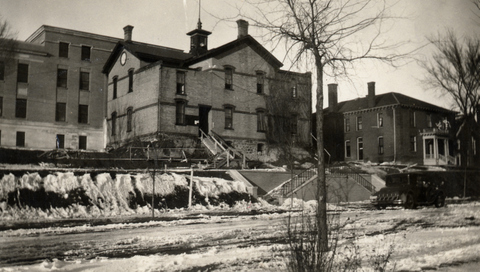 This entry was posted in Local History and tagged Glenwood 150, Glenwood Minnesota, Pope County Courthouse, Pope County Historical Society, Pope County History, Pope County Minnesota, Pope County Museum. Bookmark the permalink. When I moved to Glenwood Pope County had maybe 10-11,000 living here. Now 60 years later we have about the same amount of Citizens. But the number of employees , buildings, lots, equipment, (office and Hwy) etc. is 3-5 times larger. I counted 15 sets of wheels (for employees use)in Country new parking space over the weekend. Seems a bit out of line,seeing we have the same or even less folks to take care of. I wonder of bigger is better, seeing that the ones needing help –population that is– is the same or lower.